Bernard Arnault was born on 5 March 1949 in Roubaix, France, and is best known as a dynamic business billionaire, in particular as the Chairman and CEO of conglomerate LVMH (Louis Vuiton Moet Hennesey). So just how rich is Bernard Arnault? Forbes estimates that Bernard’s net worth is currently over $38 billion, making him the richest person in France and the 13th richest in the world, his wealth having been accumulated from his various business activities since the early 1970s. Berbard Arnault attended the Maxence Van Der Meersch High School in Roubaix, and subsequently graduated from the École Polytechnique with a degree in engineering in 1971. His father, Jean Leon was the owner of a civil engineering company, Ferret-Savinel, which Bernault joined. Bernault persuaded his father to sell the company, for 40 million French francs, and concentrate on real estate, specialising in holiday accommodation. Bernard became director of company development in 1974, CEO three years later, and in 1979, he succeeded his father as president of the company. This start clearly established a very strong base for Bernard Arnault’s net worth. 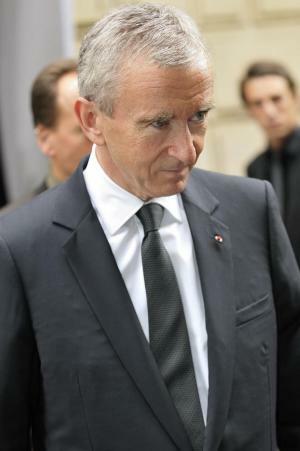 In 1984 Bernard Arnault acquired Financière Agache, a luxury goods company, and became the CEO, taking control of Boussac, which owned Christian Dior, the department store Le Bon Marché, the retail shop Conforama and the diapers industrial Peaudouce. Rationalising, Bernard soon sold nearly all the company’s assets, keeping only the high profile Christian Dior and Le Bon Marché department store. These moves considerably boosted Bernard’s net worth in cash, but that wasn’t the purpose of the exercise. Bernard Arnault gained control of LVMH soon after it was formed by the 1987 merger of fashion house Louis Vuitton with Moët Hennessy, by acquiring controlling interests in subsidiaries which built-up to dominate the conglomerate. Christian Dior, the luxury goods group, is the main holding company of LVMH, owning 40.9% of its shares, and 59.01% of its voting rights. Bernard Arnault is the majority shareholder of Dior, Chairman of both companies and CEO of LVMH. Of course, Bernard Arnault’s net worth continued to rise substantially. However, Bernard Arnault’s business empire extends further, including a variety of web companies through his holding Europatweb. Groupe. Arnault also invested in Netflix in 1999. In 2007, his company Blue Capital, which is jointly owned by Arnault with the California property firm Colony Capital, acquired 10.69% of France’s largest supermarket retailer and the world’s second largest food distributor, Carrefour. Net worth? Growing all the time. In 2008, Bernard Arnault invested in the yacht business, and bought Princess Yachts for $200 million. He then took control of Royal van Lent for a similar sum. Bernard’s net worth continued to grow. Among several awards that Bernard Arnault has received for his contribution to business, the two most significant are the Grand Officer of the French Legion of Honour, and an honorary KBE – Knight Commander of the British Empire. In his personal life, Bernard Arnault has married twice, firstly to Anne Dewavrin (1973–1990), with whom he has two children, daughter Delphine being a director of LVMH and son Antoine Head of Communications for Louis Vuitton. Bernard subsequently married Hélène Mercier, a Canadian pianist, in 1991; they have three sons.